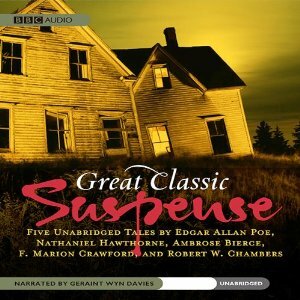 Although the name might make one think of a collection of episodes from the famous old time radio series, this is actually a reissue of a Tangled Web Audio release featuring Geraint Wyn Davies narrating classic short stories (although AudioGo has released a collection of episodes from the British version of Suspense). As was the case with the last review on the matter, just last his last appearance here, Davies effectively reads a fine selection of spooky tales. Said tales include “The Oval Portrait” by Edgar Allan Poe, “Ethan Brand” by Nathaniel Hawthorne, “The Yellow Sign” by Robert W. Chambers, “The Upper Berth” by Francis Marion Crawford and “An Occurrence at Owl Creek Bridge” by Ambrose Bierce. “The Oval Portrait” details the horrific discovery made by a traveler as he delves into the history of a painting he finds in an abandoned mansion. Personally, I suspect this story was an influence on H.P. Lovecraft’s “The Picture in the House.” Although the collection is advertised as featuring unabridged stories, that may not be the case for this particular tale. Apparently the story was originally published as “Life in Death” and a shortened version was republished under the title used in this collection. Not being able to find a copy of the original version to read, I am unable to verify whether or not this is truly uncut. “Ethan Brand” effectively begins with a father and son being startled by the sound of the unnerving laughter that heralds the arrival of the titular character, who is in search of unpardonable sin. According to this, Hawthorne wrote this after a lengthy period of not having written anything and had originally intended it to be the first part of a larger work. This probably explains why it starts off strong and gets less satisfying as it goes along. I should also note that Brand’s comment to a Jewish character would not play well today, given certain events that happened in WWII. “The Yellow Sign” is a selection from Chambers’ The King In Yellow which concerns the terrible events that unfold when two lovers decide to read an infamous play. Although H.P. Lovecraft incorporated certain things from The King In Yellow into the Cthulhu Mythos, audio versions of the Chambers originals are sadly all too rare and this is a welcome treat. “The Upper Berth” is easily the most chilling tale in this collection, wherein the investigation of why passengers of a ship keep throwing themselves overboard after staying in a certain room yields supernatural results. Finally, “An Occurrence at Owl Creek Bridge” is so famous and so well-taught in schools that I probably don’t need to describe the plot. For the few that haven’t read it, let’s just say that this tale of a Civil War soldier’s hanging isn’t quite what it appears. The narration by Geraint Wyn Davies both draws out the most suspenseful parts and draws the listener in to the point that it makes the 2 hour and 49 minute total running time seem to fly by. As was the case with Great Classic Horror, the collection’s 3 discs are packaged in a 3 panel cardboard slipcase held in a cardboard box. In short, this is a must-buy for all horror audio book enthusiasts.